In Caritate Non Ficta: Book review: "The Closing of the Muslim Mind"
Yesterday, the 38th March for Life, the Friars from Philadelphia went on pilgrimage to give witness and participate w/ 100s of thousands of other prolifers in the prayer and petition to overturn Roe vs. Wade. Our morning began with the praying of the Divine Office and Holy Mass; the superior of the Monastery of Our Lady of Mercy got some donuts for the brothers (we are in need of nourishment for the long journey... haha). Once we had our sugary fix, we quickly got last minute things together to head on the road, south, to DC. Here we see Fr. Matthew and Bro. Gerard anxiously preparing for the roadtrip, haha. Once we got on the road, the brothers chatted, prayed, read, slept, listened to a little music, trying to soak every little bit of warmth that could be stored in anticipation of the FREEZING temps in the nation's Capital(ol?). we arrived and the sign is together... there is Bro. Daniel, pumped and READY to march FOR LIFE!!! Postulant Josiah's feet were numb, but that wouldn't stop him from smiling and loving BABIES!! Our Bro. James, manning the sign w/ a smile... he's freezing cold, but he loves BABIES more than worrying about the cold!! This homily, from Fr. John Speekman, an Australian, speaks to the very heart of obedience and steadfastness to the Faith. I appeal to you, brothers, for the sake of our Lord Jesus Christ, to make up the differences between you, and instead of disagreeing among yourselves, to be united again in your belief and practice. From what Chloe's people have been telling me, my dear brothers, it is clear that there are serious differences among you. In my opinion there is nothing more demoralising and destructive going on in our Catholic Church today than division, and it’s everywhere. Division causes peace and joy to evaporate and replaces them with tension and squabbling. The great temptation, of course, is to try to paper over the serious differences tearing our Church apart but clearly that’s not working. Recently an article appeared in the quarterly magazine of the National Council of Priests of Australia (which represents no small percentage of Australia’s clergy). This article was written by a priest. 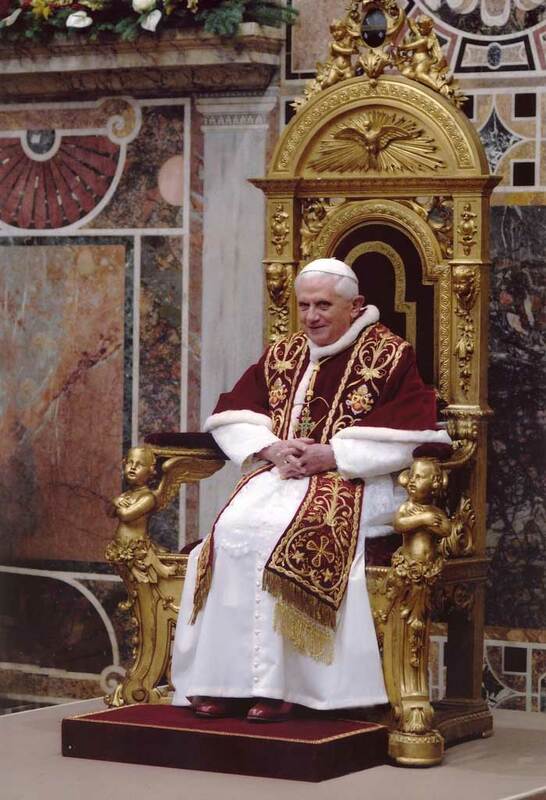 It condemned Pope John Paul as ‘out of touch in scripture and limited in theology, a bad listener.’ Pope Benedict and Pope Paul VI were similarly rubbished. This priest slated the ‘theologically limited’ Roman Curia as well as our present bishops whom he sees as ‘low on creativity, leadership, education and even intelligence.’ He dissents from various key teachings of the Church, calling them ‘policies’ and consistently refers to the vocation of priesthood as a ‘job’. All in all, and without exaggeration, this article was enough to make one cry. What was totally lacking was love for and trust in the Church. The next article, by another priest, aimed to demonstrate that missing Mass was not a big deal and should not worry us much. ‘In none of Jesus’ teachings do we find exhortations or commands to participate in weekly services of worship,’ he confidently asserts, as though Holy Mother Church had never existed. Indeed, Chloe’s people were right: My dear brothers, it is clear that there are serious differences among you. The ‘serious differences’ are really a profound crisis of faith. Catholics are unbelievably confused about the Faith. It seems all has boiled down to ‘opinions’ rather than obedience. There is continual and deliberate spreading of errors in every segment of the Catholic Church by large numbers of priests and laity. The interior disunity of the Church is a bleeding sore which no one seems willing to stem. What a disaster! And what suffering for those Catholics who know the Faith and who know how things should actually be in their parishes! Almost entirely gone is any notion of sin and so there is a general acceptance of those who habitually live in sin and there are many who do so. Confession has all but disappeared as a result of the confusion caused by disobedient priests who illicitly used the third rite of Reconciliation for many years. All this has resulted in parishes with great attendance at the parish barbeque and negligible numbers seriously living the Christian life, which has been reduced to ‘doing jobs at Mass’ and engaging in social activity around the parish. As a priest committed to orthodoxy in faith and morals, in liturgical worship, obedience to Rome and especially, love for the Church, I meet with extraordinary opposition from priests and laity who are strangely angered and even scandalised at me. I believe it is because these priests have somehow come to believe that they have been commissioned to change the Church while I, and many like me, have clung to the apparently outdated notion that we should be letting the Church try to change us. Be careful always to choose the right course! This is not advice; it is a warning - a warning on which depends our relationship with Christ and his Church and, therefore, our eternal future. Many orthodox priests are anguished by the present state of our Church. Pope Paul VI rightly foresaw that it would become worse in succeeding years. I call upon you, my friends, to be equally concerned and to make every effort you can to learn the Faith and live the Faith of the Catholic Church and to resist anyone, anywhere, who attempts to pervert or misrepresent it. 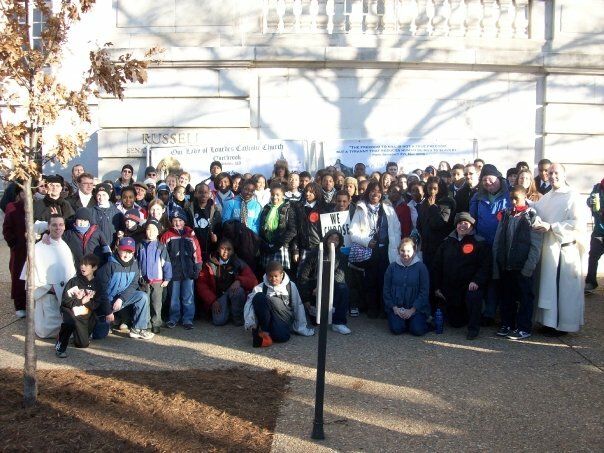 This was from March for Life, 2009. The Parish and School of Our Lady of Lourdes and the Mercedarian Friar, from Philadelphia. Today, we remember the infamous decision which ushered a complete wave that transformed the moral compass of our nation. It was, indeed, stamping out of the definitive call of His Holiness, Paul VI, to love, defend, support and promote life. On this day, the Supreme Court handed down its decision giving women a constitutional right to abort the lives of their children in the womb. Thousands upon tens-of thousands gather in Washington, D.C., today to give witness to the ultimate and most precious gift of God -- namely, LIFE. They gather to pray, sing praise to God, seek His mercy and forgiveness, and provide a glimmer of hope to the numerous young men and women who are simply held captive to the thought that there is NO OTHER SOLUTION. The Friars at the Monastery of Our Lady of Mercy have made it a special point to pray a novena in Reparation for the Decision of Roe vs. Wade, and to beg for God's Mercy upon OUR souls for those times when were a little more silent about the tragedy of abortion and the other insults to human life and dignity. The Friars will travel to D.C., Monday morning, to March and be in solidarity with the movement to protect, promote, and proclaim human life and dignity. If you cannot be at the March, on January 24, offer a moment of prayer to be solidarity with the pro-lifers everywhere; offer a prayer to petition and reparation and thanksgiving. This is 'Sonny'. 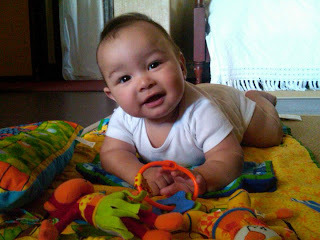 He's the godson of one of the Friars and HE is pro-life, too!! 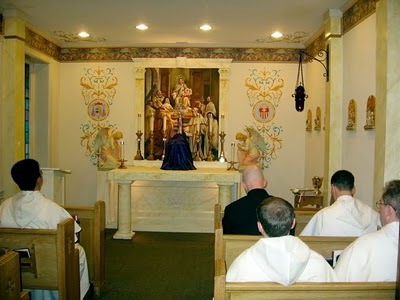 Ten years ago, today, His Excellency, Bishop Joseph Martino, consecrated the altar and dedicated the chapel of the Mercedarian Friars at the Monastery of Our Lady of Mercy, in Philadelphia. In grateful Thanksgiving to Almighty God and the beneficence of Our Blessed Mother, we commemorate this day with great Solemnity and immense JOY! Happy FEAST! 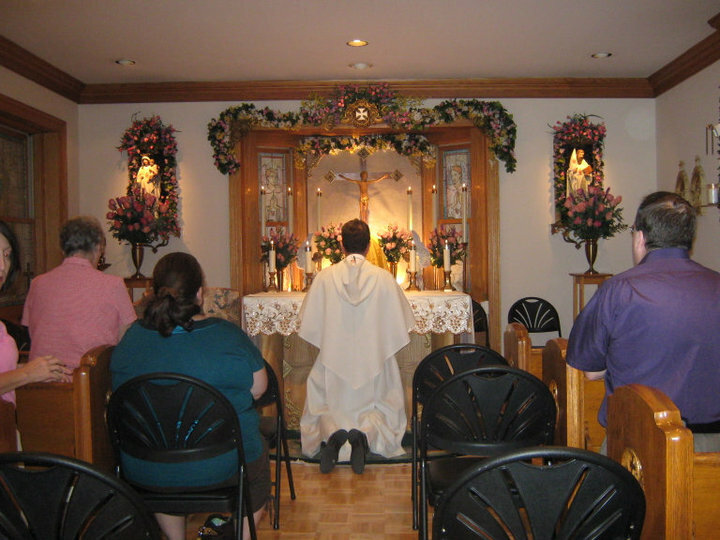 Here is a picture of our small Chapel taken from the Solemnity of Our Lady of Ransom. Fr. Matthew H. Phelan, O.de M., Superior of the Monastery is leading the Holy Rosary with our Third Order of Mercy and some members of a local Praesidium of the Legion of Mary. Following the Rosary, the friars, other clergy, the Third Order and the Legion of Mary offered Solemn Vespers. We find ourselves in the midst of the 'Week of Prayer for Christian Unity'. In reflection upon this, it needs to be said that such a week is not an invention that comes to us following the Second Vatican Council. Rather, it was an intention of the Church prior to the Council. 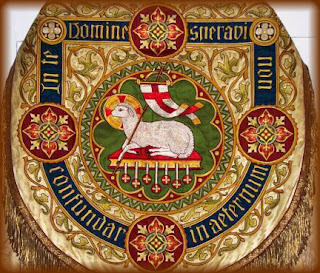 In fact, as I understand it, beginning on the Feast of the Chair of Peter at Rome, the Church prayed daily for the unity of the flock under one Shepherd, in one Church. This great "novena" ended with the Festival of the the Conversion of Paul. The intervening days included great Feasts of Martyrs, Virgins, Confessors who suffered and persevered in the Faith for the greater honor and glory of God and of His Most Blessed Mother. I thought that I would review the Introit and the Collecta from the Votive Mass which may have been offered at some point in this Week -- that is the Votive Mass for the Unity of the Church. What is important to consider in this the opening words of the Mass is the prayer of the Church toward Her Lord and Master to gather us from our differences and from the "scatteredness" of our world into a body, into a flock, into a FAMILY who give honor and praise to him. And in that unity, which ONLY God can give, we participate in His glory and experience His LOVING mercy, through the sacraments. Collect: O God, Who settest straight what has gone astray, and gatherest together what is scattered, and keepest what Thou hast gathered together: we beseech Thee in Thy mercy to pour down on Christian people the grace of union with Thee, that, putting disunion aside and joining themselves to the true Shepherd of Thy Church, they may be able to render Thee worthy service. Through our Lord. The Church, that bulwark and defense against the wiles of the devil, is at the same time the true harbor and port of the ship that sails the seas of the world on a journey toward heaven. She has the complete map, a working compass, and a sure rudder that strong. The test of Faith is to remain aboard during storms, boredom, and/or restlessness.... At times, the emotions lead us astray and we THINK that we find assurance and consolation in what feeds those emotions. With the bull Devotionis vestrae, on January 17, 1235, in Perugia, Pope Gregory IX canonically incorporated the new Order in the universal Church. For that reason, with its brief text and simple structure, this bull is especially important for the Order’s history. Some fundamental elements proceed from it. 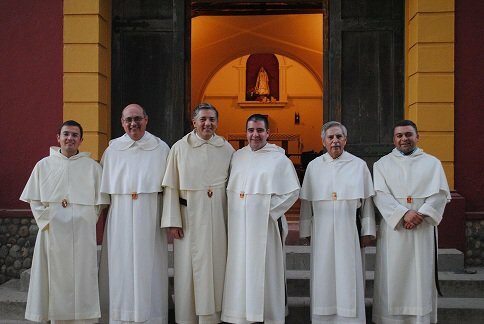 We remember our confreres in Chile as they have, this past week, elected a new Provincial Government. Let the grace and protection of Our Most Holy Mother of Mercy, guide and lead them in the ways of Her Divine Son. Let nothing be on their lips, in their minds or their hearts, that does not breathe forth love for her! From Left to right: Fr. Ramón Villagrán Arias, Counsillor, Fr. Edgardo Arriagada Figueroa, Counsillor, Most Rev. Fr. Pablo Bernardo Ordone, Master General, Very Rev. Fr. Ricardo Morales Galindo, Provincial, Fr. Carlos Anselmo Espinoza Ibacache, Cousillor, Fr. Mario Salas Becerra, Counsillor. Today, I would like to talk about a great Father of the Church of the West, St Hilary of Poitiers, one of the important Episcopal figures of the fourth century. In the controversy with the Arians, who considered Jesus the Son of God to be an excellent human creature but only human, Hilary devoted his whole life to defending faith in the divinity of Jesus Christ, Son of God and God as the Father who generated him from eternity. We have no reliable information on most of Hilary's life. Ancient sources say that he was born in Poitiers, probably in about the year 310 A.D. From a wealthy family, he received a solid literary education, which is clearly recognizable in his writings. It does not seem that he grew up in a Christian environment. He himself tells us of a quest for the truth which led him little by little to recognize God the Creator and the incarnate God who died to give us eternal life. Baptized in about 345, he was elected Bishop of his native city around 353-354. 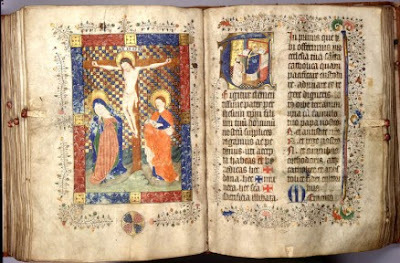 In the years that followed, Hilary wrote his first work, Commentary on St Matthew's Gospel. It is the oldest extant commentary in Latin on this Gospel. In 356, Hilary took part as a Bishop in the Synod of Béziers in the South of France, the "synod of false apostles", as he himself called it since the assembly was in the control of Philo-Arian Bishops who denied the divinity of Jesus Christ. "These false apostles" asked the Emperor Constantius to have the Bishop of Poitiers sentenced to exile. Thus, in the summer of 356, Hilary was forced to leave Gaul. Banished to Phrygia in present-day Turkey, Hilary found himself in contact with a religious context totally dominated by Arianism. Here too, his concern as a Pastor impelled him to work strenuously to re-establish the unity of the Church on the basis of right faith as formulated by the Council of Nicea. To this end he began to draft his own best-known and most important dogmatic work: De Trinitate (On the Trinity). Hilary explained in it his personal journey towards knowledge of God and took pains to show that not only in the New Testament but also in many Old Testament passages, in which Christ's mystery already appears, Scripture clearly testifies to the divinity of the Son and his equality with the Father. To the Arians he insisted on the truth of the names of Father and Son, and developed his entire Trinitarian theology based on the formula of Baptism given to us by the Lord himself: "In the name of the Father and of the Son and of the Holy Spirit". The Father and the Son are of the same nature. And although several passages in the New Testament might make one think that the Son was inferior to the Father, Hilary offers precise rules to avoid misleading interpretations: some Scriptural texts speak of Jesus as God, others highlight instead his humanity. Some refer to him in his pre-existence with the Father; others take into consideration his state of emptying of self(kenosis), his descent to death; others, finally, contemplate him in the glory of the Resurrection. In the years of his exile, Hilary also wrote the Book of Synods in which, for his brother Bishops of Gaul, he reproduced confessions of faith and commented on them and on other documents of synods which met in the East in about the middle of the fourth century. Ever adamant in opposing the radical Arians, St Hilary showed a conciliatory spirit to those who agreed to confess that the Son was essentially similar to the Father, seeking of course to lead them to the true faith, according to which there is not only a likeness but a true equality of the Father and of the Son in divinity. This too seems to me to be characteristic: the spirit of reconciliation that seeks to understand those who have not yet arrived and helps them with great theological intelligence to reach full faith in the true divinity of the Lord Jesus Christ. In 360 or 361, Hilary was finally able to return home from exile and immediately resumed pastoral activity in his Church, but the influence of his magisterium extended in fact far beyond its boundaries. 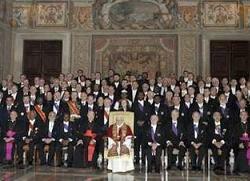 A synod celebrated in Paris in 360 or 361 borrows the language of the Council of Nicea. 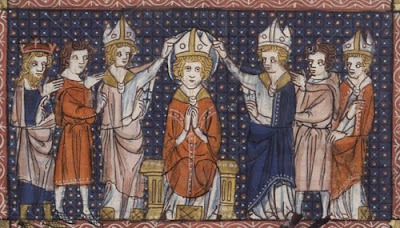 Several ancient authors believe that this anti-Arian turning point of the Gaul episcopate was largely due to the fortitude and docility of the Bishop of Poitiers. This was precisely his gift: to combine strength in the faith and docility in interpersonal relations. In the last years of his life he also composed the Treatises on the Psalms, a commentary on 58 Psalms interpreted according to the principle highlighted in the introduction to the work: "There is no doubt that all the things that are said in the Psalms should be understood in accordance with Gospel proclamation, so that, whatever the voice with which the prophetic spirit has spoken, all may be referred nevertheless to the knowledge of the coming of Our Lord Jesus Christ, the Incarnation, Passion and Kingdom, and to the power and glory of our resurrection" (Instructio Psalmorum, 5). He saw in all the Psalms this transparency of the mystery of Christ and of his Body which is the Church. Hilary met St Martin on various occasions: the future Bishop of Tours founded a monastery right by Poitiers, which still exists today. Hilary died in 367. 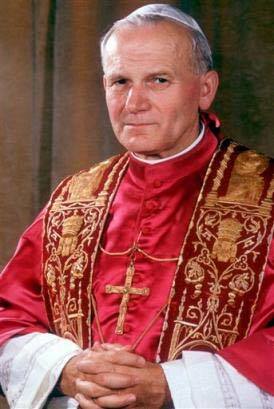 His liturgical Memorial is celebrated on 13 January. In 1851 Blessed Pius IX proclaimed him a Doctor of the universal Church. To sum up the essentials of his doctrine, I would like to say that Hilary found the starting point for his theological reflection in baptismal faith. In De Trinitate, Hilary writes: Jesus "has commanded us to baptize in the name of the Father and of the Son and of the Holy Spirit (cf. Mt 28: 19), that is, in the confession of the Author, of the Only-Begotten One and of the Gift. The Author of all things is one alone, for one alone is God the Father, from whom all things proceed. And one alone is Our Lord Jesus Christ, through whom all things exist (cf. I Cor 8: 6), and one alone is the Spirit (cf. Eph 4: 4), a gift in all.... In nothing can be found to be lacking so great a fullness, in which the immensity in the Eternal One, the revelation in the Image, joy in the Gift, converge in the Father, in the Son and in the Holy Spirit" (De Trinitate 2, 1). God the Father, being wholly love, is able to communicate his divinity to his Son in its fullness. I find particularly beautiful the following formula of St Hilary: "God knows not how to be anything other than love, he knows not how to be anyone other than the Father. Those who love are not envious and the one who is the Father is so in his totality. This name admits no compromise, as if God were father in some aspects and not in others" (ibid., 9, 61). For this reason the Son is fully God without any gaps or diminishment. "The One who comes from the perfect is perfect because he has all, he has given all" (ibid., 2, 8). Humanity finds salvation in Christ alone, Son of God and Son of man. In assuming our human nature, he has united himself with every man, "he has become the flesh of us all" (Tractatus super Psalmos 54, 9); "he took on himself the nature of all flesh and through it became true life, he has in himself the root of every vine shoot" (ibid., 51, 16). For this very reason the way to Christ is open to all - because he has drawn all into his being as a man -, even if personal conversion is always required: "Through the relationship with his flesh, access to Christ is open to all, on condition that they divest themselves of their former self (cf. Eph 4: 22), nailing it to the Cross (cf. Col 2: 14); provided we give up our former way of life and convert in order to be buried with him in his baptism, in view of life (cf. Col 1: 12; Rom6: 4)" (ibid., 91, 9). "Obtain, O Lord", St Hilary recites with inspiration, "that I may keep ever faithful to what I have professed in the symbol of my regeneration, when I was baptized in the Father, in the Son and in the Holy Spirit. That I may worship you, our Father, and with you, your Son; that I may deserve your Holy Spirit, who proceeds from you through your Only Begotten Son... Amen" (De Trinitate 12, 57). From the Archdiocese of Philadelphia, "The Sacred Liturgy: Work of the Most Holy Trinity"
Since Pentecost, the Church – present to the world – has understood herself as both the guardian of and path to the mystery of Jesus Christ. Christ abides in his Church continuing his work of salvation “until he comes” again (Cor 11:26). This work of salvation occurs principally when the Church gathers for the celebration of the Liturgy. Jesus has promised: “Wherever two or three are gathered in my name, there am I in the midst of them” (Mt 18.20). Although Jesus is present as Head of his Body the Church, the Liturgy is also to be understood as the work of the Most Holy Trinity. God the Father is both the source and goal of the Liturgy (CCC § 1077). From the beginning of creation, “God the Father of our Lord Jesus Christ has blessed us in Christ with every spiritual blessing . . . and destined us to be his sons through Jesus Christ” (Eph 1: 3-6). Indeed, the whole of the Father’s work from the beginning of time to the end time is extravagant blessing and gift. All creation sings the glory and grandeur of God, and his blessing is manifold in all living things, especially in man and woman for they are created in God’s very image. Adam and Eve’s abuse of their extraordinary gifts led to a curse upon themselves and upon the whole earth. Here is the great measure of the Father’s blessing: his merciful refusal to abandon them and all humankind forever to darkness and hopelessness. The Old Testament chronicles the great blessing of God’s plan of redemption, and his great deeds among his Chosen People. All culminates in the gift of the Messiah, the Son of God who gives his life in fulfilling the Father’s plan of redemption and salvation. 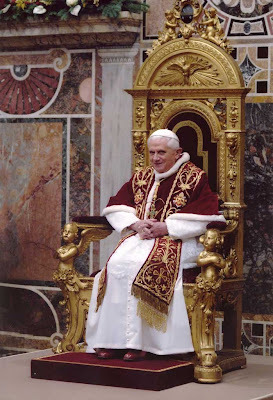 “Seated [now glorified] at the right hand of the Father”(Heb 8:2). and pouring out upon the Church, the power of the Holy Spirit, Christ now acts through the Church and her sacraments. In these liturgical celebrations, it is his dying and rising – his self-offering for the sake of the world’s salvation – which is made present in our midst. Unlike other historical events which happen once and then fade into the past, the event of Christ’s passion, death and resurrection transcends all times (CCC 1085). It is present in all ages, to all who believe and seek redemption and salvation. To enter into this redemptive mystery of Christ is to be immersed in his grace and mercy and to give thanks to the Father, the source of this great blessing. The risen Christ, one with the Father in his plan that the work of salvation be accomplished, entrusted to his Apostles – and to their successors through the ages – his power of redemption. In order to accomplish this great work, Christ, as he promised, is always present in his Church – principally in her liturgical celebrations. Specifically, he is present not only in the person of the priest... but also in the Church when she prays and sings ... in his word when the Scriptures are proclaimed . . . and in a most extraordinary way at Mass, in his holy Body and Blood. Our prayer, joined to his, provides an experience and foretaste of eternity’s praise. In the Liturgy, it is the Holy Spirit who prepares the Church to encounter Christ in its midst by awakening and strengthening the community’s faith. As the Old Testament was a time of careful preparation for the advent of redemption in Christ, similarly the Spirit’s work is to prepare the assembly for the present time of its own redemption. As teacher of the faith, the Spirit helps unveil the mystery of Christ hidden in significant events and words of Old Testament prophets and psalmists, revealing them as prototypes of the mystery of Christ to the Apostles and early Church Fathers as well as to us in our day. Since the Liturgy is truly the memorial of the mystery of Christ, the Spirit, referred to as the Church’s living memory, (CCC § 1099) recalls Christ and “all that he has done for us” (Cf. Jn 14.26) through all the scriptures that are read. By the Spirit, the Word of God deepens the faith of those who read or hear it with a ready heart and a response of acceptance and commitment. It is also the Holy Spirit who makes the saving work of Christ in the Liturgy present and active by his transforming power (CCC § 1107). The dying and rising of the Lord as an actual event happened only once and is never repeated. The celebration of that mystery and its consequences – an outpouring of the Holy Spirit’s power – will continue to the end time. In the Eucharist, for example, the priest, imposing his hands over the bread and wine, asks the Father to send the Spirit upon the gifts that they might become the Body and Blood of the Lord. The efficacy of that invocation – with Jesus’ words of consecration – truly brings about the divine event of the dying and rising with the Lord, communion with Christ and within the Church. Clearly, all liturgical prayer (to the Father, through the Son, and in the power of the Spirit) is Trinitarian in its essence. Where Jesus is, there is the Father; where the Father and Son are, there is the Holy Spirit. 1. In the Liturgy of the Church, how do we see the action of each of the Persons of the Most Blessed Trinity? 2. In what parts of the Mass are the Persons of Father, Son, and Spirit most especially highlighted? 3. What was Adam and Eve’s response to the gifts given to them? What should be our response to the gift of the Liturgy? and sent your Spirit that we may grow in holiness. Though these graces, may we always return to you, our source. AS ROME’S 7,000-strong Christian Copt community prepares to demonstrate against terrorism tomorrow in the wake of the recent bomb attack which killed 21 people outside a Coptic church in Alexandria, Egypt, Pope Benedict XVI and senior Church figures have once again expressed their concern about the persecution of Christians throughout the world. Speaking to the faithful in St Peter’s Square after he had celebrated the Epiphany Mass on Thursday, the pope offered special prayers and wishes for those eastern churches which “are currently sorely tested”. Earlier in the week, the pope had called the January 1st bombing at the Coptic Church of the Saints in Alexandria a “despicable act of death”, comparing it to the widespread violent intimidation being suffered by Christians in Iraq. Two Christians were killed in Iraq on December 30th as a result of 11 bomb attacks while the Iraqi Christian community was profoundly shaken by the October 31st explosion at the Syro-Catholic Cathedral of Our Lady Of Perpetual Help in Baghdad. That bombing killed 68 people, including two priests. The Christmas-New Year period was also marked by deadly attacks on Christians in Nigeria and the Philippines. These killings also come in a week when the pope’s annual message for the January 1st World Day of Peace claimed that Christians were now the most persecuted religious group in the world. In Genoa, the president of the Italian Bishops Conference, Cardinal Angelo Bagnasco, in an Epiphany address, echoed the pope’s concerns. Meanwhile, such is the ill-feeling generated by the Alexandria killings that a delegation from Rome’s Islamic community has been asked not to attend tomorrow’s anti-terrorism march by the city’s Copt community. 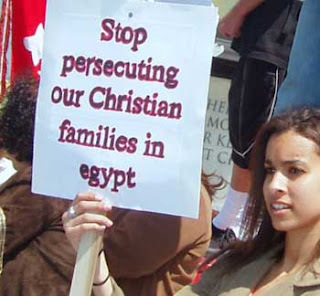 “We feel bitterness and sorrow for what we suffered in Eqypt,” said the Coptic bishop Barnaba el Soryany, adding that the Islamic community could hold their own demonstration but that this one was for “us orthodox Copts”. 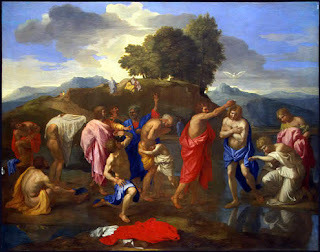 How can we enter into the mystery of Jesus’ humble self-abasement and baptism? Gregory of Nazianzus, a seventh century Church father tells us: “Let us be buried with Christ by Baptism to rise with him; let us go down with him to be raised with him; and let us rise with him to be glorified with him." Do you want to see changes in your life? And do you want to become a more effective instrument of the gospel? Examine Jesus’ humility and ask the Holy Spirit to forge this same attitude in your heart. As you do, heaven will open for you as well. The Lord is ever ready to renew us in his Spirit and to anoint us for mission. We are called to be “light” and “salt” to those around us. The Lord wants his love and truth to shine through us that others may see the goodness and truth of God’s message of salvation. Ask the Lord to fill you with his Holy Spirit that you may radiate the joy of the gospel to those around you. "Lord Jesus, fill me with your Holy Spirit and inflame my heart with the joy of the gospel. May I find joy in seeking to please you just as you found joy in seeking to please your Father".